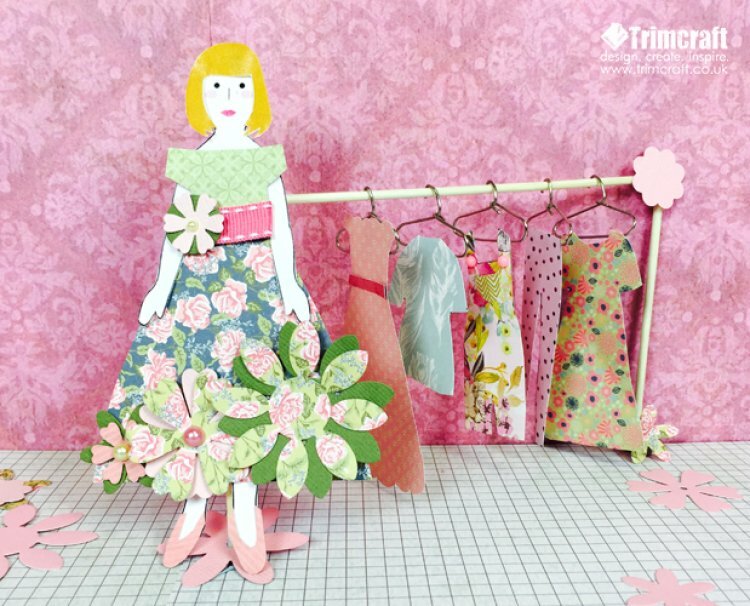 We used the fabulous Dovecraft Leyton paper pack and the First Edition Paper Flowers paper pad to make our paper wardrobe but you can mix and match your papers or colour in the designs to create original outfits, perfect for any catwalk! 1. Download the free template and cut out the paper doll and hair. 2. For this paper outfit, we have chosen the retro dress template and cut out the design using contrasting Dovecraft Leyton prints for the top and skirt. 3. To embellish the centre, we then added a small strip of the ribbon to create a belt. We used the First Edition Flower Die Set to add a die cut circle and small flower to the side of the belt to create a très chic accessory! 4. To complement the rose pattern skirt, we die cut several flowers with a contrasting Dovecraft Leyton green floral print and textured card. We then layered the flowers according to their size and added to the bottom of the skirt. Our template features three flower designs which you can use if you do not have a die cutting machine. 5. Use the paper shoe templates to cut out little pumps for your doll. 6. As a finishing touch, we then added adhesive pearls to the centre of the flowers on the skirt and the belt. We also used the template to create even more stylish outfits for our paper doll! We especially love the dungarees made with the First Edition Paper Flowers floral paper! Which papercraft collection would you use to create fashionable designs with? Comment below with your suggestions! We would love to see the outfits your children have made with these so remember to upload them onto the project gallery!